The trouble some people find with some of their Boldport kits though is that they are just too good. What can you do with them, when getting too busy with hacking them would despoil their beauty? [Paul Gallagher] has the answer in one case, he’s used not one kit but two of them as for a guitar tuner project. At its heart is a Boldport Cuttlefish ATmega328 development board, and for its display it uses a Cordwood Puzzle as an LED array. All the details are available on a GitHub page, and it’s a modified version of an Arduino guitar tuner he found on Instructables. In particular he’s using a different pre-amp for an electret microphone, and a low-pass filter with a 723Hz cut-off to reduce harmonic content that was confusing the Arduino’s algorithm. The result is a simple-to-use device with an LED for each string of his guitar, which you can see in the very short YouTube clip below. It joins many other tuners we’ve featured over the years, of which just one is this ATmega168-powered project with MIDI-out. It is widely accepted that Gutenberg’s printing press revolutionized thought in Europe and transformed the Western world. Prior to the printing press, books were rare and expensive and not generally accessible. Printing made all types of written material inexpensive and plentiful. You may not think about it, but printing–or, at least, printing-like processes–revolutionized electronics just as much. In particular, the way electronics are built and the components we use have changed a lot since the early 1900s when the vacuum tube made amplification possible. Of course, the components themselves are different. Outside of some specialty and enthusiast items, we don’t use many tubes anymore. But even more dramatic has been how we build and package devices. Just like books, the key to lowering cost and raising availability is mass production. But mass producing electronic devices wasn’t always as easy as it is today. Firewood aficionado and general axing enthusiast [KH4] likes to cut and split his own fire wood. To burn a tree trunk sized piece of wood efficiently, it has to be split into 4 smaller pieces. [KH4] does this with 3 axe swings, the first splitting the main log in 2, then splitting each half in half again. Although he likes swinging the mighty axe, he still would like to increase the efficiency of each swing. Well he’s done it! This is accomplished by making a Cross Bladed Axe that has an X-shaped head. Each axe swing should split a log into 4 pieces. That results in 66% less swings for the same amount of wood split! This projected started with two spare axe heads. One was cut in half with an angle grinder. The two axe head halves were then ground down so that they match the contour of the original axe head. Once the fit was good, the welder was broken out and all 3 axe head pieces were combined into one beastly mass. After the new head was polished and sharpened, it was re-assembled a new hickory handle. We have to say, the end product looks pretty awesome. There’s a video after the break of this axe in action. Check it out! Have you ever seen how these axe heads used to be manufactured? The fourth of five random drawings for Hackaday’s Trinket Everyday Carry Contest was held tonight. The winner is [davish] with his entry, Trinket Watch. [davish] loves the current crop of smartwatches, but he wants one he can truly call his own. 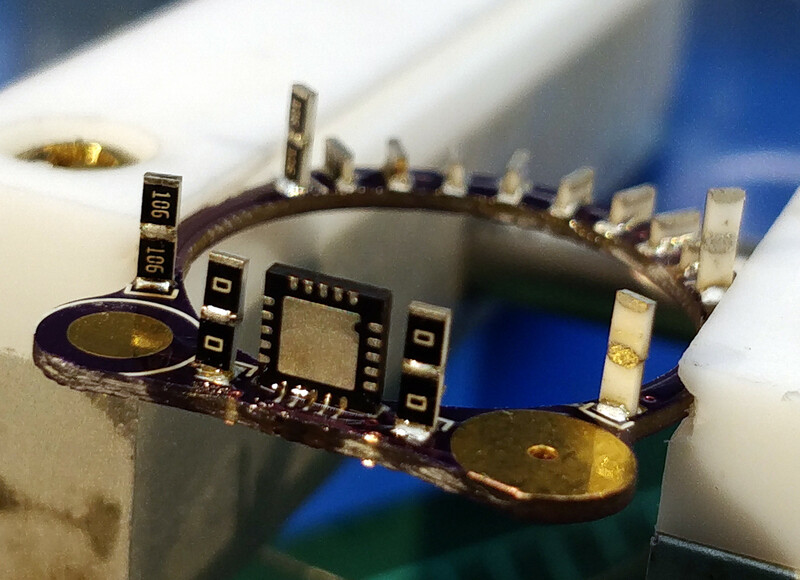 He’s using the Pro Trinket along with an Adafruit 1.3″ OLED for display duties. That little OLED can show a lot more than just numbers though. [davish] already has Adafruit’s logo demo running on the device. Trinket Watch is going to start out as a simple Arduino coded “dumbwatch”. After the basics of time and date are out of the way, [davish] hopes to add a Bluetooth module and turn Trinket Watch into a full-fledged smartwatch. We hope [davish] enjoys his new Cordwood Puzzle from The Hackaday Store. No jigsaws here, cordwood is a puzzle that involves solder! If you get a piece wrong, it’s time to break out that solder wick and fix your mistake. The puzzle is built using the cordwood assembly technique which was popular in the 1950’s and 1960s. We’re not kidding about it being a puzzle either – there are no instructions for this kit! [davish] will know he’s got it right when all 3 LEDs light up. If you didn’t win this week, all is not lost, you still have one more chance to win a random drawing! Our next drawing will be on 12/30/2014 at 9pm EST. The prize will be a Teensy 3.1 and audio adapter as a prize. To be eligible you need to submit your project as an official entry and publish at least one project log during the week. The main contest entry window closes on January 2, 2015 – but don’t wait for the last minute! Hit the contest page and build some awesome wearable or pocketable electronics!